It is comforting for us as humans to glorify humanity. We want to believe that naturally, we are good; however, when faced with the inevitable misfortunes of existence, us humans find it easy to succumb to our personal grief. We begin acting on selfishness and greed; then, we blame it on survival. Exploring this journey of humanity, of learning to be human and choosing how to be, is Blows with the Wind. Blows with the Wind is a breathtaking story about the dilemmas of being human. 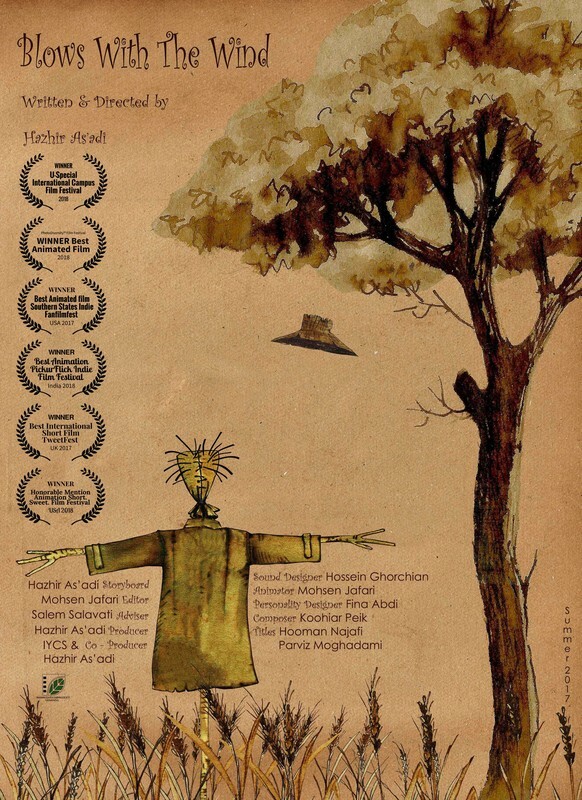 Written, directed and produced by Hazhir As’adi, the film illustrates the unfortunate events of a scarecrow as he slowly comes to life. Gradually, as pieces of himself are taken, broken, given away and lost, the scarecrow becomes human. During his journey, as the sun sets, he gets caught in a storm and stumbles across other scarecrows who are not faring much better than himself. Down on his luck and soaking wet, the scarecrow must decide which face of humanity he will become: the face that survives by taking, or the face that learns to live in kinship. Coloured in beautiful sepia tones with watercolour and parchment textures, Blows with the Wind is a simple but resonate film. Animated by the talented Mohsen Jafari and storyboarded by As’adi, the films endearing visuals work perfectly to encapsulate the films exploration of the complications and nuances of humanity and the heavy of weight of learning to be human. Beginning the film with warm, muted tones, Blows with the Wind soaks us up in the scarecrow's journey. The welcoming warmth of the sepia coated scarecrow and the calming tans of the rolling landscapes make it easy to become invested in the scarecrow, setting us up to be swept down by his coming tribulations. As the rich, warm tones of day transition into the deep, cold blues of night, our own hearts, setting with the sepia sun, fall under the familiar weight of humanity pressing on the scarecrows shivering shoulders. Combined with their use of colour, As’adi and Jafari’s techniques of perspective also work exceptionally to place us into the scarecrow's journey. Over the course of the film, as the scarecrow becomes more and more human, we are brought closer and closer into the scarecrow’s perspective. At first, we are only introduced to him with a still shot of his inanimate face. Then, a little closer, we watch over his shoulder, as still and helpless as he is himself, while the man who tears his jacket drives away. In the next scenes, we are brought closer still and we look at the other scarecrows he meets directly through his line of sight. Using increasingly darkened vignettes, Jafari situates us in the scarecrow’s place and washes us in the encompassing melancholy that comes with being human. Blows with the Wind is a stand out short animation. Jafari’s beautiful animation combined with As’adi’s simple, subtle but hard hitting story has made for a wonderful film. Reminiscent of classic fables and fine art, Blows with the Wind exemplifies the hardship of being human and the difficulty of choosing not to survive over others and learning to live with others in the face of misfortune.